Just as vibrant as the first and just as original as expected. Presenting The Peculiar #2 The Whatnot by Stefan Bachmann. The sequel to Stefan Bachmann's riveting and acclaimed debut novel, The Peculiar, which Publishers Weekly called "An absolute treat for readers of any age" and the Los Angeles Times compared to "Dostoevsky's Crime and Punishment, Charles Dickens's A Tale of Two Cities and more recent classics, such as J. K. Rowling's Harry Potter and Lemony Snicket's A Series of Unfortunate Events." Twelve-year-old Pikey Thomas is missing an eye, a family, and friends of any sort. Named for the box he was found in-Thomas Ltd. Crackers and Biscuits. Premium Quality-Pikey lives under the chemist's shop and does odd jobs for him. One day, running from bigger boys set on bullying him, Pikey finds himself in front of a grand, beautiful house. There he meets a black-winged faery who begs for his help. The faery's wing is damaged-cricked and hanging at an uncomfortable angle-and Pikey clicks it back into place. 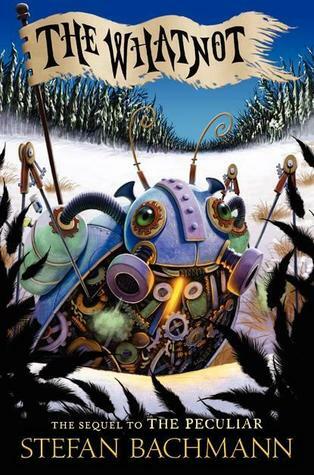 It's a small gesture of kindness and bravery in steam-powered Victorian London, where faeries, now banned, are on the run or imprisoned, where the human armies are preparing for war, and where the changeling Bartholomew Kettle, aided by Arthur Jelliby, still searches for his missing sister, Hettie. This is the epic, imaginative, unforgettable, and ultimately hopeful sequel to Stefan Bachmann's acclaimed debut novel, The Peculiar. Numbered as book 2 but essentially a companion book to 'The Peculiar'. While it is not necessary to read the aforementioned before reading this, but I like to be informed and as such wanted to find out what happened before diving into this story. But yes the main characters are there. The Whatnot, essentially starts out a few years after the vents of the Peculiar. Hettie is now stuck in the Faery. Barty searches for ways to get there and rescue Hettie. And this enters Pikey Thomas. In Bachmann's Gothic fantasy world, Pikey Thomas starts out as the faery touched boy only thinking about candied apples and keeping his place of sleep intact, unknowingly holding the key to the salvation of all. Alternation between the point of views of Hettie in the old country and Pikey in England, Stefan Bachmann tells this dark fantasy. The once scared Hettie, now holds even more characters and a much stronger personality. Barty and Pikey end up paired in the search for Hettie..... but the Sly King looms.... an entity you do not mess with. Maintaining the captivating and imaginative narrative, Bachmann extends this vibrant world. One of the most enjoyable moments for me was the detailed description of the Old Country and the fineness of the Fey. "An epic sequel to Bachmann's The Peculiar"